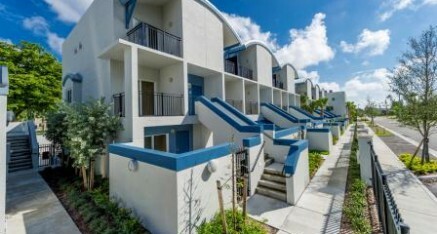 Carrfour Supportive Housing has joined up with Tacolcy Economic Development Corporation and the Florida Housing Finance Corporation to develop a $12 million affordable community called Parkview Gardens in Miami. Parkview Gardens, which recently celebrated its grand opening, is located in Miami-Dade County’s Liberty City. The community includes 60 garden-style apartments. Preference was given to local Liberty City residents and area residents, and provides housing for people earning at or below 60 percent of the area’s median income, and six units were set aside for those earning less than 33 percent of the area’s median income. Parkview Gardens is managed by Crossroads Management, Inc., a property management subsidiary of Carrfour Supportive Housing. The community includes six three-story residential buildings. Units at Parkview Gardens range in size from one- to three-bedroom apartments. Amenities include a community center, exercise room, computer lab, library and picnic area. There is also a two-story parking garage for residents. According to Stephanie Berman-Eisenberg, president and CEO of Carrfour Supportive Housing, the community also features green elements. The site includes low-volume irrigation, native landscaping and permeable paving at the terraces. The lighting fixtures are Energy Star. The roofs on the buildings are white reflective roofs, and there are solar shades on east- and west-facing windows. Carrfour Supportive Housing developed Parkview Gardens to help local low-income residents, but also to benefit rest of the community.